What a great topic! I had a couple ideas that might work with your current lines of thinking. First, if you’ve got a player willing to do it, go with a story penalty. Much like in that Buffy season when Willow forcibly pulled her out of heaven back into her body, have the character come back “not okay” somehow. Maybe disadvantage on checks that involve being connected to life/happiness (mostly social things), or maybe they start to see shadows & spirits wandering the world, disconnected from the realm of the living (not undead, per se, but those that haven’t passed on but also aren’t willful enough to actually manifest). You could also have other death-like special effects. Maybe animals are less comfortable around the PC. Maybe he can see Kestrels or similar creatures (a la Harry Potter). Maybe babies cry or milk curdles or the atmosphere occasionally gets colder. Maybe the bard suddenly finds her music style turning darker. For a druid, ranger, or maybe cleric of Life or Nature, this could be a huge deal. 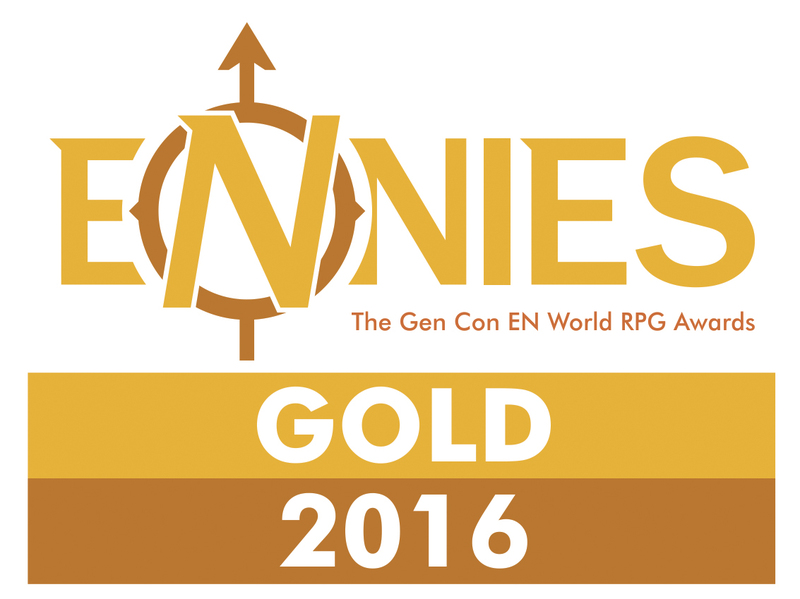 For a fighter or wizard, it’s less of a big deal, but still feels significant. In your “3 Strikes & You’re Out” model, maybe each time you come back, you permanently have a death save checked off on your sheet… since you’re closer to death, it’s harder to avoid it now. This doesn’t hamper you like a lower Con or level would, but once you do get to fighting off death, it’ll be a shorter fight. After 2 resurrections, two death saves are checked, and after the third time, you’re barely connected to the living world anymore. Add in the Buffy-esque effects, getting worse with each trip back, and it could feel really epic. Maybe as a DM you could allow questing to reconnect with life somehow, but the character may realize along the way that they’re just “going through the motions” (sorry, I’m really in a Buffy mindset right now). Great discussion to have with your players, though. Find out what kind of game they want. I think 3.0 or 3.5 had a hardcover that gave options for playing the ghosts of your dead characters in other adventures (not dissimilar to White Wolf’s old game Wraith… which was fantastic, by the way). Can I take a moment and just express how much I love the idea of permanently marking off the death saving throws? I was going to come in and talk about how I love the danger of PCs dying and never really liked raise dead and stuff like that but now… woof, I think Three Strikes + marked saves is enough to win me over. I’d be completely okay with permadeath, though. But what ever happened to Reincarnation?! I had thought that they brought that back. Where does that fall in your modules? I love reincarnation. That’s back. I’m not sure it fits the same mold since it wholly changes your character already, which is so cool! All great ideas, which I am happy to steal!!! I’ve always been very conflicted about player character death. I like to run games that focus on story, and I don’t want their characters to die if I’m planning on major plot beats for the future. 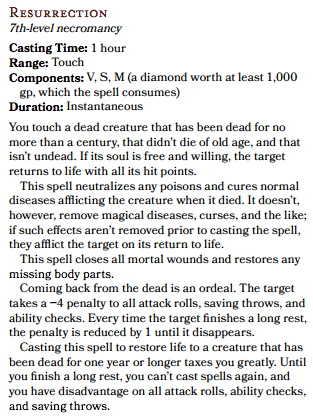 On the other hand, resurrection spells really cheapen the impact death can have. I remember one of my 3.5 where resurrection spells and items were too easy to come by and the players never even blinked once at a character death. I could see the three strikes rule working to combat that. I eventually changed my tune about PC death in another campaign where I let the character’s deaths have a major impact to the world or story, sort of similar to the death moves from Grim World. Eventually once the original party was all dead, we started to run a side campaign of adventures in the underworld. It was a fun way to play around with death in an RPG. 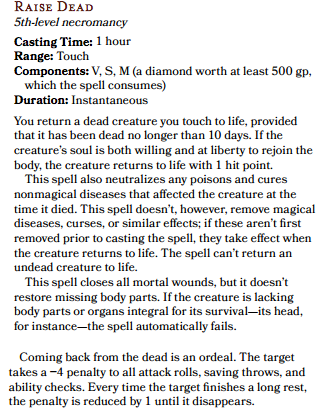 For my upcoming D&D game, I’ve stated outright that there are zero resurrection spells and items in the setting. My players have taken that well, but a few of them are fretting about it. We’ll see how that goes. I also really like @joelastowski idea of permanently marking off a death save, making it hard to cling to life. I might work that into my game. That idea of a side campaign in the underworld is awesome! Let me know how the zero resurrection rule goes! Death works very differently, depending on the system. In a Deadlands LARP I was in for a while, everyone knew that death was going to happen a lot. We all had favorite characters that just met the wrong end of a bullet at times, and that was okay, because that’s the way that world worked. White Wolf’s recent LARPing rules also have a great mechanic: mediation. This allows many situations that might result in player death to instead be handled in “dramatically appropriate ways.” So if two vampire PCs have a dispute, and one reasonably “could” kill the other, instead they can go to mediation, an out of character discussion where the two players can say “hey, I know you could kill my character, but I’ve put a lot of time into him. What is your character looking for, and is there a way your character can feel like she’s beaten me without utterly killing me?” So maybe the attacked character gets badly beaten, maybe getting a permanent scar, and now agrees never to publicly challenge the attacker in front of underlings. The same thing can happen with interactions between players & game masters, so long as it’s reasonable. I always liked that way of letting the story overpower the rules of life & death. I also used to have characters who were known to have epic deaths in our old West End Star Wars game back in college. Created more than a few force ghosts that way, sacrificing myself to save the rest of the group. I think the key is to be up-front with your players about the way death (and resurrection) works in your game. Definitely agree. It’s a touchy subject so always be upfront with your players. It is a game and the point is to have a great time, right? That White Wolf thing is pretty cool! PC death is not fun. One of the ways I like to mitigate the pain is by using a feature that I ripped off from AD&D: the Henchman. At fifth level (and every two levels after that) each character is entitled to roll up a 1st level fanatical henchman (secondary character for the player). These henchmen are controlled by the player, and once the main group has a whole set, they can assist with big projects, or be sent off on secondary missions. Thus, when a PC dies, the player can continue running immediately with their Henchman as their new primary character. (Note: Henchmen also get their own henchmen at 5th level and above). By the time the PC dies (and with resurrection magic relatively rare in my world) the Henchman should be a pretty good level from running with a higher-level group. It works remarkably well. 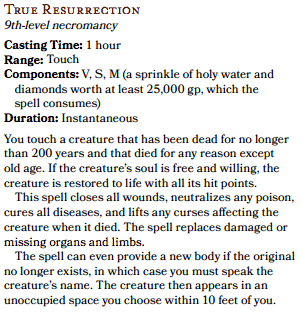 And with resurrection magic being rare and unreliable (I like the 50% chance of total success you suggested), PCs tend to not throw away their lives needlessly. But if something happens, you’ve got backup right there (most of the time, anyway). Yeah the henchmen idea is a great one! It’s also in the new DMG. I also have characters step into a famous NPC role sometimes, especially if the rest of the party already likes and respects that person. An excellent blog post about life & death in 5e. I actually built a whole world around this. The world has reached a place where any time anyone reasonably rich or an adventurer dies they can just be revived. If you went to hell and can’t get back, well just hire some PC’s to go find you. The Ancient Greater Master Wizards frequently travel the outer planes and meddle with the boundaries of mortality. The Gods are all afraid that the wizards will cast them down if they try to stop them. Finally, the Great Council of Angels decide to do something about this. They band together and cast the Gods out of the outer planes. The Gods, having no home now, tear apart the Prime Material Plane and make their own domains out of it. Some of them retreat into the elemental planes as well. While this is happening, the evil gods of the netherhells came and made dark reflections of the new material spheres that now lurk underneath the upperspheres. The outer planes are sealed, and all soul transit is strictly kept track of by the Angels, and the fiends are also sealed in their homes. Many the wizards are trapped on Sigil in a deep slumber, which has now become a floating, almost spaceship like city which passes near the spheres at one point of another, along with being covered in portals to all the different material spheres. The old factions are gone, replaced by some which haven’t all been fleshed out. The spheres rotate around the elemental planes. The plane of shadow connects the spheres to their counterparts and the ethereal plane connects the upper spheres in a ring. There are 3 primarily elf, 3 primarily dwarf, and 3 primarily human, upper spheres with other races interspersed. One of them is Firestorm Peak, Look out! There are also some orbiting spheres, like one with dragons, and one where angels and fiends fight. There are also Angelica, the angels new home, and the Blood Fields, a fiendish plane. These are the only (new) outer planes that people can get too. whew, I think I’m done now. This is really cool. It reminds me of the other post I did on how being able to return from death would change your world. Now I really want to play in yours! Kudos!